But do you know what it is called, why it was given that name, and most importantly what the drawing represents? The drawing is most often referred to as The Vitruvian Man. By the way, have you ever noticed that the text above and below the drawing is written from right to left in a reverse way? This is called mirror writing. Da Vinci used this technique for most of his notes, which can only be read in a mirror. Only the signature in the bottom right hand corner is written in the normal way, from left to right. Both the drawing and the text illustrate Vitruvius’s points on human proportions, i.e. the relationships between the different parts of the human body. You can see lines on the drawing along the arms, on the face, at the base of the neck, on the chest, under the belly, and at the knees, which show these proportions, along with the circle, the square, and the line under it. 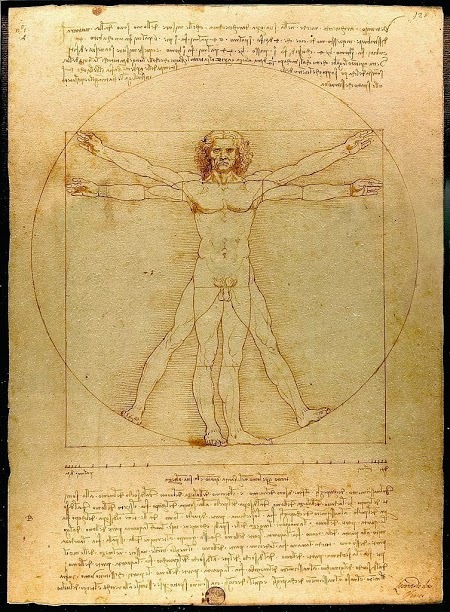 The Vitruvian Man does not represent one person in particular. It represents all of us. No matter what your height and shape are, you follow these proportions too. You are an example of the human perfection shown in the drawing. For example, measure the length of your outstretched arms from finger tip to finger tip and you will find it is the same as your height. Here is another one: put your foot on your forearm with your heel in the hollow of your elbow, and you will see that the length of your foot is exactly the length of your forearm to the palm of your hand. Also, the length of your hand is one-tenth of your height, so if you are 1.70m tall, your hand is 17cm long. Try it now, and you’ll see. You’re perfect. We all are.